Free from artificial colours, flavours and preservatives. 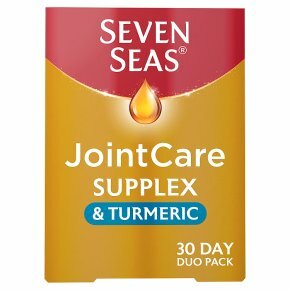 Support for: - Cartilage: Vitamin C - Bones: Vitamin D - Muscles: Vitamin D - Connective Tissue: Manganese Glucosamine plus Omega-3 & Turmeric 4000mg (as 85mg extract) Convenient combination Glucomega® of Glucosamine + Omega-3 Seven Seas JointCare® Supplex® & Turmeric has been formulated with: - Vitamin C contributes to normal collagen formation for the normal function of bones and cartilage - Vitamin D to help maintain normal bones - Vitamin C to support the normal function of the immune system - Manganese contributes to the normal formation of connective tissue Contains: - 85 mg Turmeric extract - 240 mg Glucosamine Sulphate 2KCl - 178 mg Omega-3 nutrients To support an active lifestyle Contains active ingredients that work with your body over time; you may need to take for up to three months, before experiencing full benefits. Dosage: Take one capsule and one tablet a day with a cold drink. Do not exceed the recommended dosage.